Abstract: You may already be thinking the OCZ PC3200 Platinum Limited Edition memory is "only PC3200," and why would anyone want that instead of a pair of "PC5000 Ultra Extreme Terminal Prejudice 2 DDR?" The Athlon64 has always performed better in UT2003 than the Pentium 4. It seems like the P4 gets a bigger boost due to overclocking but please remember that the CPU is also running faster. 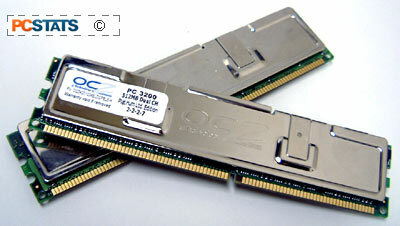 Finding good enthusiast memory is a very difficult task as there are so many choices out there. Should one go with a dual channel memory kit over regular DIMM's? Should you get high speed, high latency memory or slower memory that can run tighter timings? It's confusing even for the veteran overclocker; I would hate to try and wade through all that information if I were a newbie. By default the OCZ PC3200 Platinum Limited Edition memory is rated to run at 200 MHz while using 2-2-2-7 timings and running on a voltage of 2.7V. I anticipated it would also be good at overclocking because it's using Winbond BH-6 DRAM. OCZ places nickel plated copper heat spreaders onto the memory; they do nothing for cooling, but it does help protect the DDR modules from physical damage. In terms of performance, as you can see from the benchmarks the memory runs very well in both an Athlon64 and Pentium 4 system. When it comes to overclocking, even with only 2.8V the OCZ PC3200 Platinum LTD Ed memory simply flies! Using 2-2-2-5 timings we were able to run at a very respectable 234 MHz on the Athlon64 system and on the Intel rig we ran at 240 MHz FSB! With a retail price of $405 CDN ($306 US), the OCZ PC3200 Platinum Limited Edition memory is actually a pretty good deal since most 1GB dual channel memory kits run for well over $450 CDN! If you're in the market for some memory that can overclock well, you'd better get these bad boys while you can because they'll be gone soon.